If you follow on Facebook or on Twitter you know what an exciting day we had yesterday!! 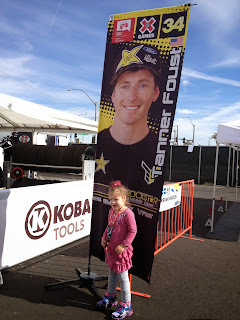 We were invited by The Make-a-Wish foundation to spend the day at the rally car races and along with that we were able to have breakfast with Tanner Foust and he also took for a spin in his car around the racetrack. This day turned out to be way more then I thought it would be. Hailey loves meeting new people, making new friends and sharing her story. I love that she makes such an impact on people that she meets. Before breakfast was served Tanner met with the Wish kids, and upon Hailey's turn she gave him a Hugs for Hailey bracket that he put on right away! So sweet of him! She had lots of fun posing for the cameras (and there were a lot) with big smiles and her arm around Tanner. Hailey loved having her "special necklace" that she did not take off ALL day! Tanner was so personable. Sat right down, talked about anything, had breakfast with the kids. The kids were honestly too excited to even eat. They were running around all over! Tanner took the kids down to the track for a ride along. Hailey wouldn't go by herself so we all hopped in the car! After 2 laps around the track we where told to go WHEREVER we pleased. Our credentials would allow us in the pits by the drivers or in the private suites. We took a walk around to see the other guys! While walking around we met John, the owner of Smoke'n Sams Bar-B-Que. He invited Hailey, Josh, and me to have lunch. He said, "you order ANY thing you like!" Thank you John! This little girl with Hailey had become Hailey's new best friend. Her name is Amanda and she had the sweetest heart. She hugged on Hailey and played with Hailey and they never left each others side. Amanda's mom and dad were also there, and I really loved talking and getting to know this family. I talked non-stop to Amanda's mom. It's so great to communicate with someone who knows exactly what you are going through. Thank you Joann!! Another person who we owe a huge thank you to is Kate (pictured below). She works for Global Rally-Cross and worked with the Make a Wish foundation to put this whole thing together. She has a passion for giving back and working with charities close to her heart. She worked so hard and I want to make sure she knows that she did an AMAZING job! Thank you Kate! Hailey's adrenaline was pumping after that ride around the track. The jumps were her Favorite! Thumbs up!! Josh thought this event was pretty awesome. It was pretty easy to twist his arm and get him to stay for the whole event and watch the races from the suite. While we were in the suite, after lunch, I spotted Brandon and Leah Jenner and I told Joann. She was surprised at how fast I recognized them. I told Hailey that Brandon and Leah sing music, and Hailey said, "They like Hugs for Hailey?" I told her I didn't know, but we can ask. She reached in my purse and got out 2 bracelets to give to them. We went up to them and I introduced Hailey. Hailey handed over the bracelets and gave Leah a Hug. Leah asked if it was okay to post a picture of Hailey on her Twitter account to help spread the word of Hailey and her story. I of course said YES! I was so grateful that Brandon and Leah would do something we appreciated so much. I think we gained 100 likes in a matter of hours. Thank you Brandon and Leah. Hailey loved seeing you wear her bracelets! This post could go on forever with details of each driver and how nice they were to Hailey and welcoming her behind the scenes and letting her in the cars and taking pictures with them, but I won't bore you! Tanner and Kate did not send us home empty handed! 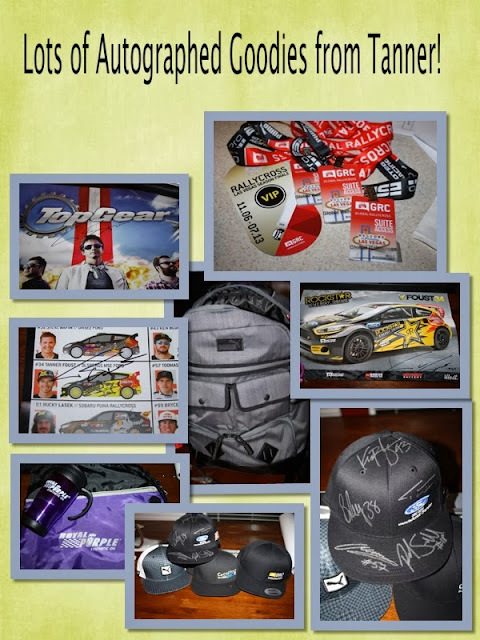 Each wish child received a Puma back pack filled with fun things that were autographed. There was another person we were looking for, we knew Rutledge was at SEMA but we didn't spot him at the race. Everything about yesterday was perfect. The way people take time to do things for others is amazing. 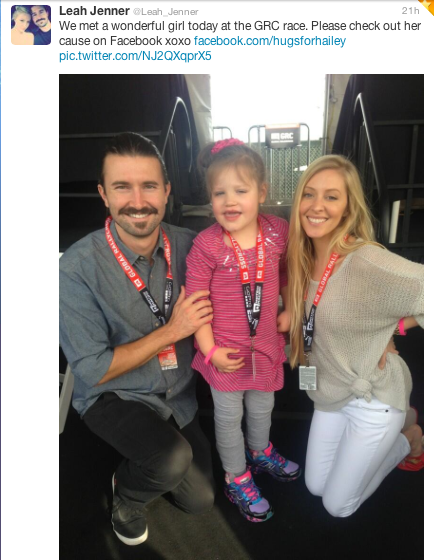 Tracy at Make a Wish, Brandon and Leah Jenner, Kate and Tanner from GRC, you put smiles on children's faces yesterday! I can't thank you enough for that. I will always cherish these memories! *Special thanks to Amanda's dad Greg for some of the great pictures he shared with me!